Unlike in the dog world, where all dog races belong to the same species (as proved by the fact that they can interbreed), horses and burros, though members of the same genus, are regarded as being completely different species. "Asinus" in the burro's scientific name, suggesting a certain assiness to the burro, hints at a further truth. That is, burros, asses and even donkeys are pretty much the same thing. They are all Equus asinus. "Burro" is just the Spanish word for "donkey." I say "pretty much the same thing" because some people make a distinction between the descendents of donkeys introduced into the Americas by the Spanish in the 1500s, which they call burros, and donkeys introduced directly from Europe, which they call donkeys. Even people making a distinction between burros and donkeys appear to agree that both, being of the species "asinus," are asses. Jackasses are just "jack asses," or "male asses." This brings us to mules. 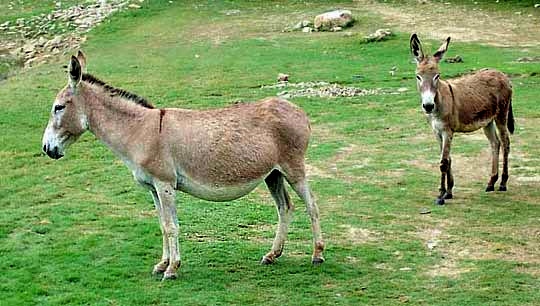 A male donkey or burro, called a jack, is crossed with a female horse to produce a mule. A male horse can be crossed with a female donkey (called a jennet or a jenny) to produce something that in North America is called a hinny, but in the United Kingdom is called a mare, or jenny, with the word jennet more commonly applied to the offspring of a female donkey and a male horse, regardless of whether the foal is female or male. The diploid chromosome number of the horse is 64, while that of the burro is 62. This mismatch between chromosomes causes nearly all mules to be sterile. Well, all this is gone into in much more detail at the American Donkey and Mule Society website at http://www.lovelongears.com/. One last thing to say is that burros/donkeys/asses are originally African species evolved to thrive on arid, scrubby land, which is pretty much what they have here. 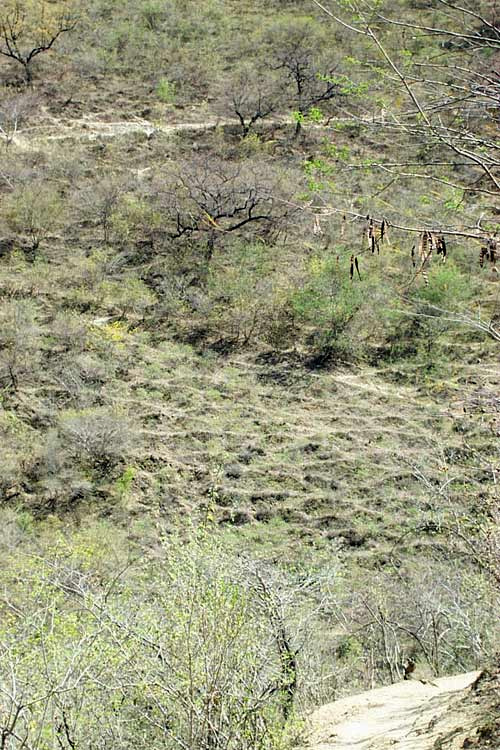 Notice the pale, reticulating network of footpaths ornamenting the slope. Those trails mostly were made by free-roaming burros and cattle. During my recent hike between Cuatro Palos and Bucareli, through a mountain landscape about as rugged and isolated as you can find, I was never out of sight of such footpath reticulations. No cattle were out there, just burros. I suppose that a formula someplace can explain why free-roaming burros eventually impose upon a landscape intricate, geometrical footpath-patterns. A hiker on such a slope mainly thinks two things about such trails: On every square inch of the landscape they provide access to burros who nibble on everything that isn't spiny or bitter, and; two, too often the hiker ends up on a burro trail instead of the main trail. Feral horses and burros should be eliminated from key wildlife habitat, including the desert bighorn habitat of the American Southwest, and from designated natural areas. In other situations, their numbers should be carefully regulated to minimize conflict with wildlife, livestock and other range values. Like most normal people, I think burros are nice animals, smart, and fun to be around. But the above picture hints at the fact that's painfully obvious over enormous areas here: That humans have created a colossal ecological disaster by introducing burros into ecosystems where they don't belong, and killing off the predators that otherwise would control burro numbers. I agree with the Sierra Club's position, not because it's an agreeable solution but because, like so often is the case (as with the war in Iraq), irresponsible human behavior has put people who come later into the position of being forced to choose the least bad among several very bad options.